Dan Martin lost a little bit of time in the overall but his up-and-coming team mate, and last year’s Tour de l’Avenir champion, Tadej Pogačar went close to victory despite a crash. But there is no stopping race leader Max Schachmann; the German winning again. Dan Martin missed a four-man move that clipped off the front in the latter part of stage four of the Tour of the Basque Country today. However, the Irishman’s UAE Team Emirates squad had 20-year-old Tadej Pogacar in the breakaway. And it was the neo pro, and last year’s Tour de l’Avenir champion, who pushed race leader Max Schachmann (Bora-hansgrohe) closest. 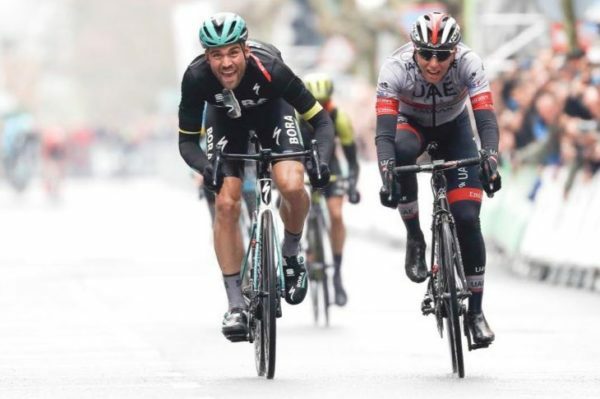 However, in the final sprint for the line in the rain into Arrigorriaga there was no beating Schachmann, who claimed his third win in four days. And thanks to a 10-second time bonus for winning, and gaining nine seconds on the large group behind the breakaway, he has now extended his lead with two stages remaining. The stage winner and runner-up went clear over the late 4km Zaratoma climb with Adam Yates (Mitchelton-Scott) and Jakob Fuglsang (Astana). Dan Martin finished in 15th place at nine seconds. He remains 5th overall but is now 1:08 down; the race leader gaining 19 seconds on him today. Unfortunately Nicolas Roche of Team Sunweb crashed and is out of the race.